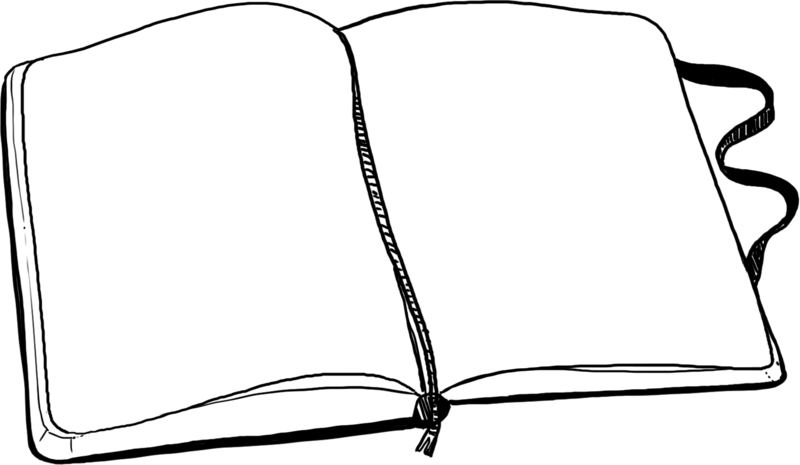 Pages that are overflowing with content– streams of consciousness and entire pages filled it up with drawings and tightly packed words, with no spaces left empty. This idea that paper is at a premium and that each space must be filled gives your pages a historical, valuable feel- as traditionally often paper was at a premium, and those with an expensive diary or notebook would not waste space or paper, or that on their travels it was the only book they had with them, and were forced to fill each square inch with as many observations as they could. Excessively random or Obsessively neat and academic– both of these approaches emulate an academic look to your notebook. 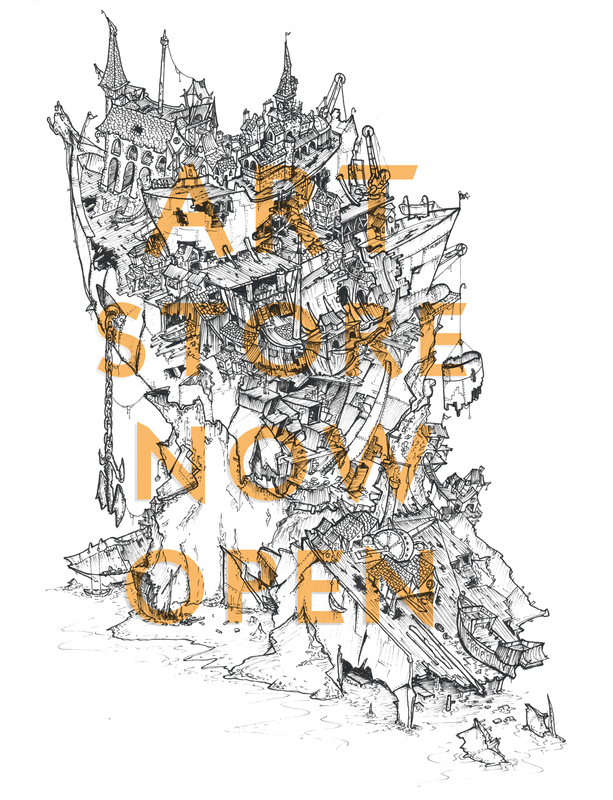 The first presents it as a constant stream of consciousness, an artistic approach in which all your ideas are spilling onto the page. It has an eccentric, artistic approach that you might expect to see from a traveller or explorer, filling up each page with observations and ideas coming in faster than there is time to writer. On the other hand, an academic, super neat approach speaks to the scientific- it’s sometime you’d expect to see in a maybe Mary Ward‘s journals, or the sketches of an inventor in the industrial age. Well Traveled, Well Worn, Well Used– This is something best described as “What Indiana Jones would carry in his satchel“, is something that applies not just to notebooks, but also to satchels and clothing. People like the idea of stuff getting used, worn out, hastily fixed and flecked with rust and grit. They want things not simply sitting on a coffee table waiting to be looked at but not touched, but things that have a history, that can make them feel like they got their hands dirty and worked at something. It’s all a part of the distressed, recycled and well-worn fashion that spreads from everything to clothing, automobiles or interior design. Your notebook should not be handled like a religious text, but shoved in bags and stuffed in your pocket, torn and ripped when the time suits it, and treated like apiece of equipment. You want your notebook to tell the story of where you traveled just by looking at it. Indiana Jones didn’t have time to worry if his notebook wasn’t getting scratched, he was busy fighting nazis! When he got wet, burnt or covered in grime & old mummies, he just dusted himself and his notebook off and got back to work! To be fair, when a notebook has the ability to save your live, you should maybe take a bit more care of it. Mainly, these styles seem to emulate a Victorian approach to research, or maybe reminiscent of a kind of romanised “Age of Exploration”- you could probably see someone sitting in a gas-lamp lit cabin around the coast of China taking notes on all the amazing new people and plants they’ve found. Possibly Hiram Bingham, jotting down notes on Machu Pichu, or a writer in a coffee shop lazily making up amazing new poems or stories in the back of a battered journal. ALSO I’M NOT COMPARING MYSELF IN ANY WAY TO THESE PEOPLE! Sorry, I just had to make clear I’m not pretentiously trying to claim having a notebook puts you on the same levels as any of these people! No, I’m just trying to explain the reason people seem to love this style of writing so much. Actually, I think all of it can be summed up by what I was talking about in my first paragraph- “people like old stuff”. However! There is an emerging side to this notebook-taking hobby, but an ugly, consumer side that I have a real problem with. It’s a genre of books I think I can probably only describe as “Creativity-By-Numbers”. 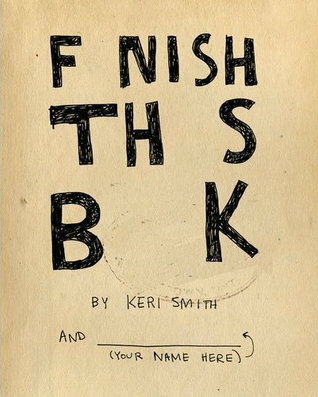 In 2007 artist Keri Smith released “Wreck This Journal“, which describes itself as “the anarchist’s Artist’s Way — the book for those who’ve always wanted to draw outside the lines but were afraid to do it.” Or, more literally, it is pages of instructions for creating a “unique” battered, worn and scribbled book of doodles and originality that you can then presumably show off to all your arty friends. “Fill this page with circles”, suggests one page. “Crack the spine” says another, probably quickly. “Poke holes in this page using your pencil” says one page, sticking it to the proverbial man and those squares who don’t tear holes in books. “Collect Dead Bugs here” says another, frankly pretty gross suggestion (incidentally, if you do want to collect insects, then do it properly rather than sticking rotten bugs in a manky jotter). But that’s not what people normally do with books! This person is a free spirit and what’s more UNIQUE! As I seem to end up saying in everything I write- I’m not trying to sound pretentious or holier-than-thou, or seem like some kind of condescending notebook hipster (there’s a term I never thought I’d have to use!) about people wanting to create books full of cool drawings and unique, random ideas just as I like to do. My problem is that the very act of buying a book full of instructions on how to make a unique, random “quirky” journal is the very opposite of what you’re trying to achieve! It’s a book of hypocrisy, that on one hand describes itself as “anarchistic”, trying to style itself as random and subversive and asking you to “think outside the box! Show people your crazy random side!” while at the same time handing you a paint-by-numbers instruction manual on how to be random and subversive and think outside the box. What’s the point in having a book that while you may have filled in yourself, is simply the same as everyone else who owns and followed the same guide as you? I used to love paint by numbers and colouring books, but I wouldn’t show it off as anything unique, I was just following instructions. 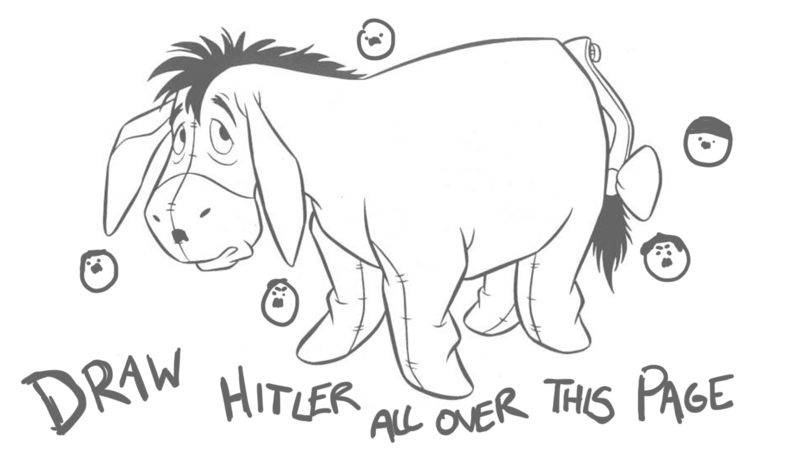 I certainly wouldn’t describe it as “Anarchistic”, even if my Winnie the Pooh colouring book also asked me to stick a dead beetle on Eeyore’s face. Man, that girlfriend must be a right scream- she seems so random and crazy! What will she do next? Look! she’s already out in the garden trying to smash a robin between the pages of her book because it told her to go outside and destroy some nature! How quirky. As a side note though, if your girlfriend’s first thought when ordered to do “something spontaneous and unexpected” by a bug-mashed book is to throw said heavy and quirky journal at your head, you might want to consider some relationship counseling. Or possibly even a restraining order? (Alternative title- How I stopped making books and learnt that other people will fill them in for me)which includes such quirky new ideas such as “Leave this book somewhere overnight”. No, don’t leave your book somewhere overnight. Look after it. Enjoy writing in it. Don’t worry if it doesn’t look as cool or quirky as the ones you see on tumblr. 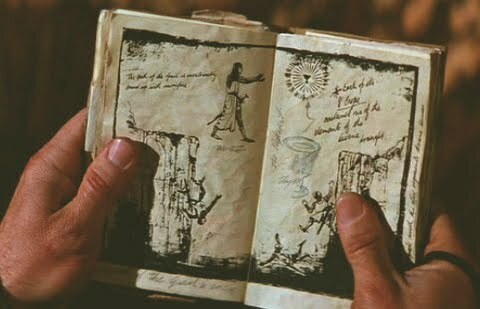 You’re not making a prop, you’re making your own notebook filled with your own ideas. Ps. I also saw this in Waterstones, that looks like the biggest pile of crap I’ve ever seen in my life. Not only is it just a blatant rip off of Wreck This Journal, it’s printed on the most atrociously bad cheap pound-store paper that even the weakest flowing ink pen would probably stain through. Trash. 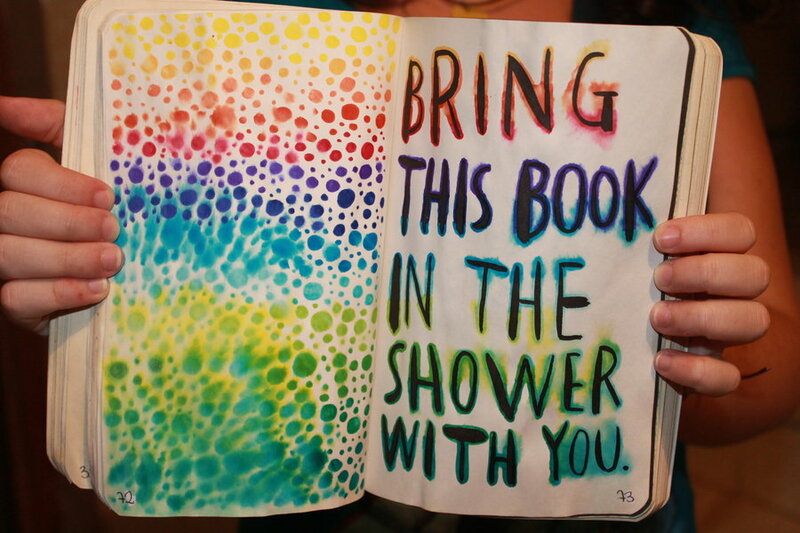 I got Wreck This Journal and was quite disappointed in it, too. I’ve always been a bit too precious with my notebooks, so I thought it would encourage me to relax a bit and use and abuse them as they ought to be, but it just annoyed me. Washi tape and stickers in a pretty notebook will do me fine. Exactly my thoughts. I picked one up in a charity shop that someone had presumably given away, and it felt restrictive more than anything else. Why write in this book when I could just use a nice blank notebook that I can properly call my own? PS. Washi Tape is mankind’s greatest invention.